It is every Internet retailer’s nightmare – a down website. While the goal is to have safeguards in place so that websites never experience unexpected downtime, sometimes stuff happens. Unfortunately, down sites can lead to very unhappy customers, lost sales and a bad reputation. Typically when that happens, brands just roll with the punches and figure out what needs to be done to prevent downtime from happening again. Apparel retailer American Eagle, however, took a different approach recently by deciding to turn downtime into a marketing opportunity. After experiencing downtime on November 16th, the retailer decided to apologize to its customers via email (even to those who were not shopping at the time of the technical issue). The email came with the catchy subject line “Son of a glitch,” with the top line of the message reading “Oops! 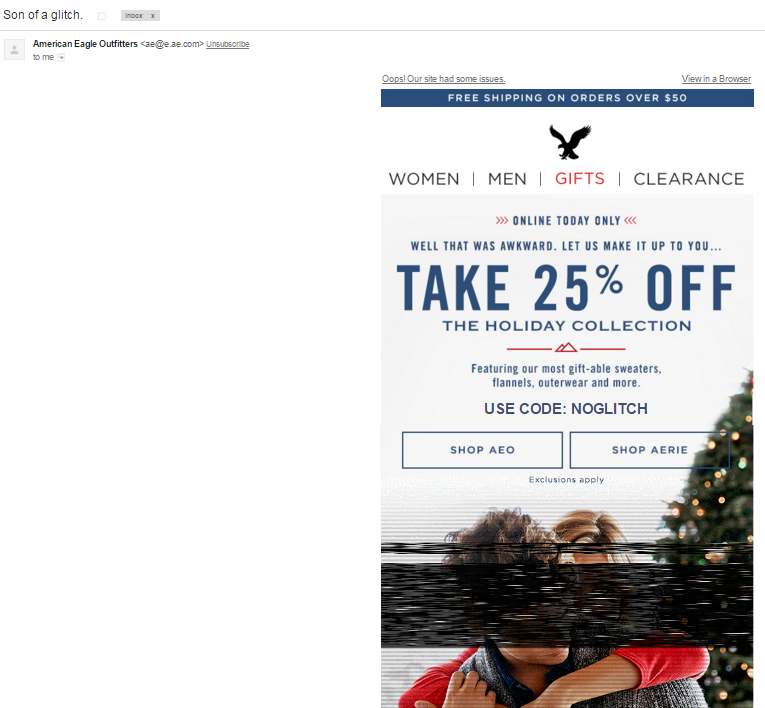 Our site had some issues.” The body of the message included a 25-percent off coupon with the coupon code “NOGLITCH” and displayed a fuzzy marketing picture that was designed to look like it was having technical issues. In addition to its email marketing campaign, American Eagle took additional steps to acknowledge the problem by responding to customer complaints on its official Facebook Page. While the downtime still likely cost the retailer revenue (sales couldn't be made), it did a good job of turning a bad situation into a marketing lesson that others can learn from. After all, glitches happen to even the top sites on the 'Net.